David P. Niemeier, an officer in the litigation practice group at Greensfelder, has been selected as a member of the 2016 Leadership Council on Legal Diversity (LCLD) Fellows Program. Participants in the LCLD Fellows program are employed at large law firms and in-house legal departments nationwide and participate in a yearlong professional development series. Fellows cultivate leadership skills by working with LCLD's top leadership and managing partners at some of the nation’s leading law firms as well as the general counsel of Fortune 500 companies. 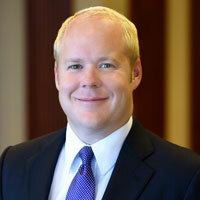 Greensfelder has been a member of LCLD since 2010, and Niemeier is the firm’s fifth LCLD fellow. The LCLD Fellows program is built to increase diversity at the leadership levels of the nation’s law firms and corporate legal departments. Participants will be challenged to improve their professional brand, build relationships that enhance professional development, participate in corporate learning experiences and sharpen leadership skills. Niemeier represents businesses and individuals in matters including commercial disputes, white-collar defense and tort claims. He is a 2001 graduate of the Saint Louis University School of Law and earned a bachelor’s degree in political science from SLU.